Spring is here, weather is gorgeous…FISH ON! Hot off the red phone update line and straight from Sarah at Sebastian Inlet Bait & Tackle. Spanish Mackerel and Bluefish are biting on Got-cha lures, spoons and bucktail off the North Jetty. Snook are also hitting on live bait and live shrimp. Watch the tide changes, the Snook seem to be biting at the beginning of the outgoing tide but a lot are too big to keep so please practice appropriate catch and release techniques to ensure survival. You’ll find Sheepshead on both sides of the channel and shrimp, sand fleas or fiddler crabs have been working well to bring them in. Anglers have been picking up some Pompano in the surf and Sarah says go with a combination of frozen shrimp, clams and sand fleas. Check out these photos sent in by one of our regulars on the North Jetty – Stephanie Lindgren! An avid fish whisperer as we like to call her, we want to wish Stephanie all the best and offer our hearty congratulations. 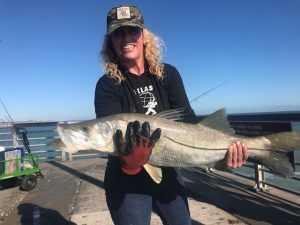 She launched The Saltiest Sweet Spot – a personal fishing and hunting guide service in September after spending 21+ years working for a TV station. “I love what I do! I target mostly beginners – women, children, veterans and first responders dealing with PTSD – to introduce them to some therapeutic activities and we all know mother nature cures all!” At the end of January, Stephanie took out Jermaine Jackson from Naked and Afraid Season 9, episode 9. He is an avid fisherman from California. 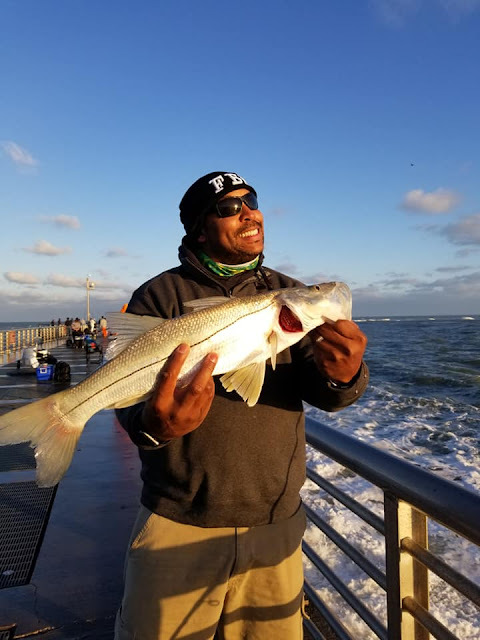 He rocked it off the North Jetty and got busy netting fish for other anglers.